Memorial is the day we honor the heroes who gave their lives protecting our beautiful country. Although it is a day often filled with barbecues, swimming and spending time with friends, we all should take a moment to remember those who bravely fought to allow us to live in such an amazing place. God Bless America! I decided that today I would use the same reference photo that I used for my demo last Saturday. I wanted to try a smaller one in my usual "daily" 6" x 6" size. I brightened up the water a bit and also opted for the yellow highlight on the boat on the left. The photograph of the painting could be better but I am in a rush. I need to leave for the airport to pick up my oldest son. He is home for three days for a swim meet ... and then back to Stanford for dead week and finals. The calm before the storm ... perhaps? Oil, 8" x 10" on canvas panel, framed. Ahhh ... another day when I fully intended to head up to my studio to paint ... and I just couldn't seem to get away from my computer. 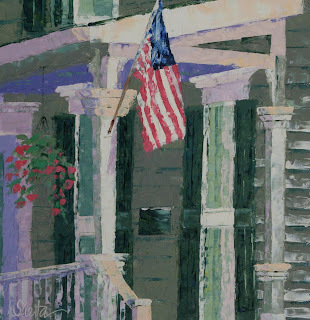 I have been uploading new images to my store at imagekind.com which offers prints of my artwork. 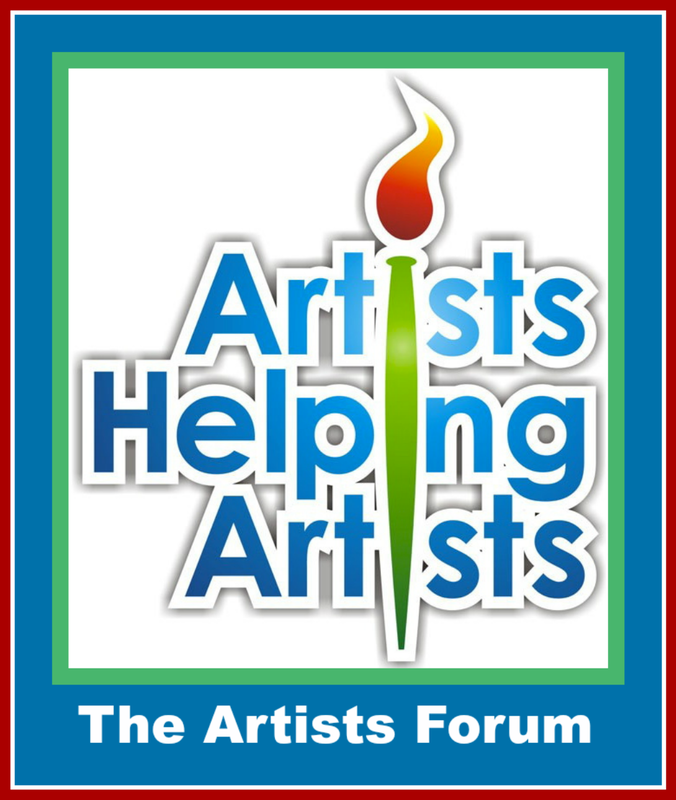 It is a tedious process but I do think it is an integral part of the "Selling Art While You are Sleeping" concept, which was the discussion for our "Artists Helping Artists" blog talk radio show today. If you missed the show, you can listen to it here. I think it was on of our better shows. Lots of great ideas and input. So thanks to all of you that participated! And ... I sold five large prints on imagekind today so my hours at the computer were worth it! I almost decided not to paint today. I spent about six straight hours at the computer earlier today ... uploading photos to Imagekind and Fine Art America, updating my website and facebook, and getting ready for the "Artists Helping Artists" radio show that is tomorrow morning. Not to mention the four calls to Dreama (my artist buddy and radio show co-host and soon to be ... Workshop Co-Leader!) and some organizing of my office. Perhaps I was "procrastinating" ... who knows? But I am glad I forced myself up to the third floor (funny how I make it sound like it is so far 'up to the third floor'). Because I thought this painting would be fun to paint and I really am happy with the way it turned out! I need to figure out a way to paint in the morning (before I get stuck on the computer) and see if I can "paint ahead". Now that's a novel idea, right Dreama? As I drive around town there are "hints" that the jacaranda trees will be in full bloom soon. the trees are slowly showing signs of purple and I know within a few weeks they will be in full bloom. There are a few streets in South Pasadena that offer a sky of purple blossoms. When my oldest was in high school and I would take him to morning swim practice (at 4:30 am!) 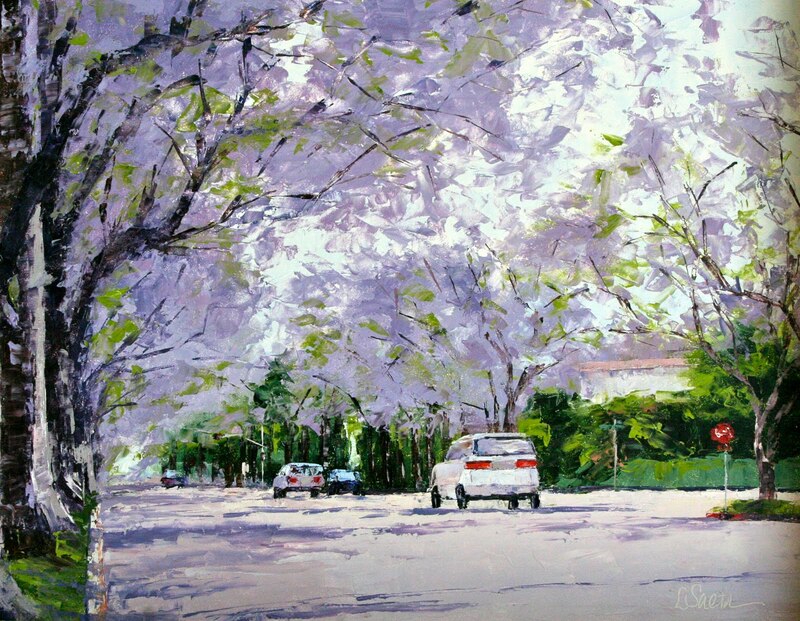 we would marvel at how the streets were covered in purple blossoms. The jacaranda trees are messy, but the beauty they offer all of us makes it all worth it! 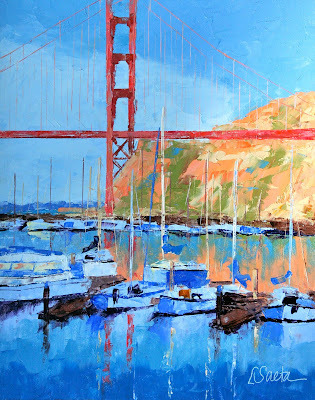 I gave a palette knife demonstration at SoPas Gallery yesterday and ... it was so much fun! There were wonderful artists and friends in attendance and I do think I might have some new "converted palette knife painters". The painting above is the completed demo piece, and one of the lucky attendees was awarded the painting as my gift! I used a reference photo that featured a very cloudy day, so it was fun to bring out the sun and brighten up the painting. It only took me about an hour and twenty minutes to complete the demonstration. 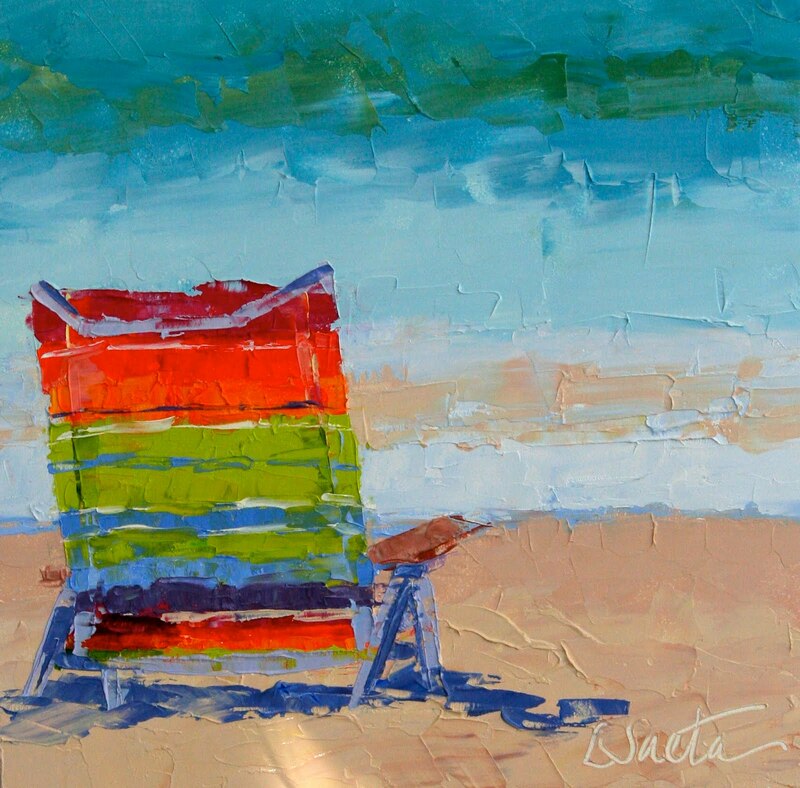 I will be teaching a palette knife workshop in the fall so let me know if you are interested! This is another one of my paintings in my Headlines Show. It's an old chevy and the painting is based on a wonderful photo taken by Laurie Alle. 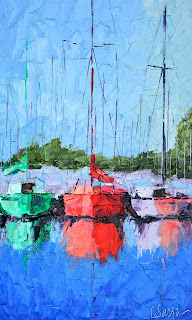 Laurie has a great blog titled Glimpses of South Pasadena and many of her photos were inspirations for my South Pasadena Headlines Show. . And ... if you are near South Pasadena today, I am doing a palette knife demo from 2:00 - 4:00 at the SoPas Gallery at 1121 Mission Street. 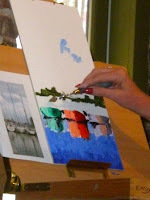 I will be painting an 8" x 16" painting and one of the lucky attendees will win the demo painting. Hope to see you there! Don't forget to join me for my demo this Saturday at SoPas Gallery from 2:00 - 4:00 pm. I will be giving away the painting at the end of the demo so you don't want to miss it! Now that the "pressure" is off, I need to start pressuring myself again to start painting! I have had such a nice week but it really is time to get back in my studio! 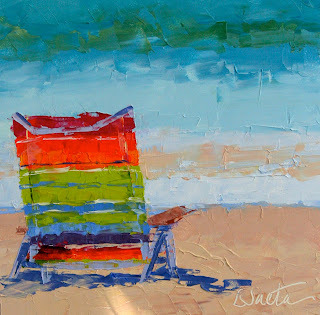 Let's hope I spend some serious time at my easel today. And don;t forget to join Dreama and me on our Blog Talk Radio show. It's live at 9:00 am this morning and call in information is located to the right on my blog page! I was having some issues with "blank lines" in my blog posts, especially when I added pay pal buttons. I just figured out what to do. 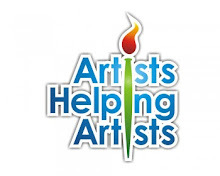 Just click on the other page of my blog called "Artists Helping Artists" and I have posted a link to a video as to how you can delete these blank lines. If there are any other issues or problems you are having with your blog, please post them here! 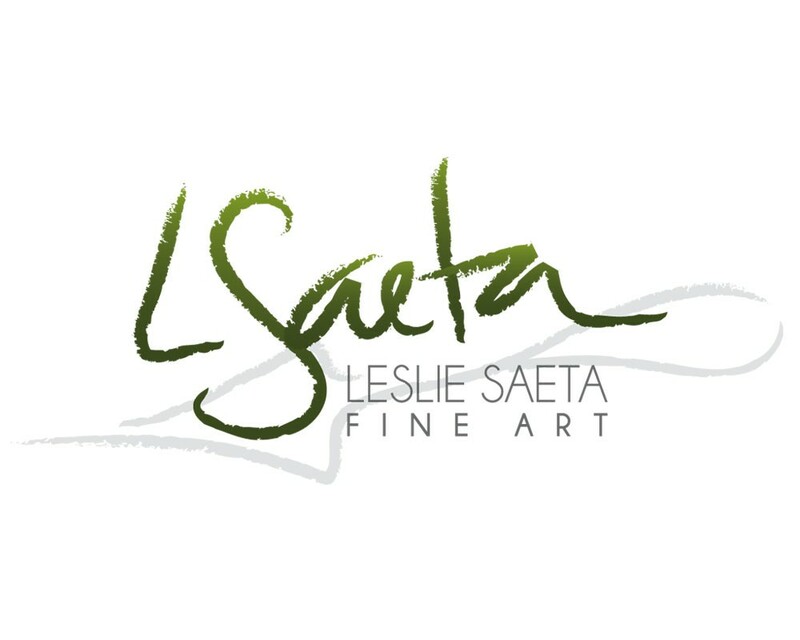 If you are near the South Pasadena area this weekend, please join my for my demo on Saturday, May 22nd from 2:00 - 4:00. I will be giving away the demo painting so be sure to come! The demo will be at SoPas Gallery which is located at 1121 Mission St. in South Pasadena. You can call me at 626-799-8507 for more information. Lakers win by 21 so BIG discount on my art ... and a new logo! A few things ... the Lakers won tonight by 21 points, so that means all of my paintings are 21% percent off until the next playoff game! Yikes! 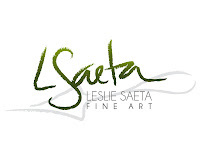 My new "art logo" is posted above (and all over my website and facebook). I do think "branding" is important for any business. And even though artists can use their "art" to brand their name I really wanted to pursue a "new look and feel" for my art. Other than my paintings. So ... my dear friend Dreama Tolle Perry came to the rescue. She suggested an on-line service called www.logotournament.com. Basically, it's a site where you agree to spend $250 (or more) up front to have a log designed for you. They have hundreds of artists that will submit logos to your contest. When you sign up, you provide tons of information about what you want. 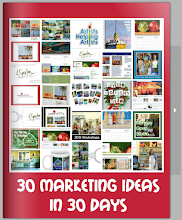 I included links to my website and blog. Your "contest" is then posted on their site and within a few hours the logo ideas start posting to your "contest page". It's important that you provide feedback and rank the logos as they come in. Because the artists really do listen to what you have to say. And all of the artists will continue to submit new ideas based on your feedback. Early on, I decided I wanted a palette knife in my logo. Then, one artist pulled my signature from my paintings into the logo. I really liked that. Another saw that I painted reflections and added reflections into the logo design. At the end of seven days, you have the option to extend the contest another week. So I did. By the end of the 14 days, I had over 100 logos submitted. And they were really great. I LOVE my winning logo. I feel like I am back to normal today. For the past three months I have been absolutely crazed with my show at SoPas Gallery and so many other "art related" happenings. Fortunately, starting this morning, I think my "crazed life as an artist" is behind me. I can breathe and not feel the stress that has been in my studio for the past few months. I do have some new goals for myself and on top of the list is to get more sleep. And I so hope that this "new life as a less stressed artist" will last more than a week! So here is my question. Is it always this stressful being an artist? Or is it just me? I am ready for the Balboa ArtWalk which is this Sunday, May 16th. 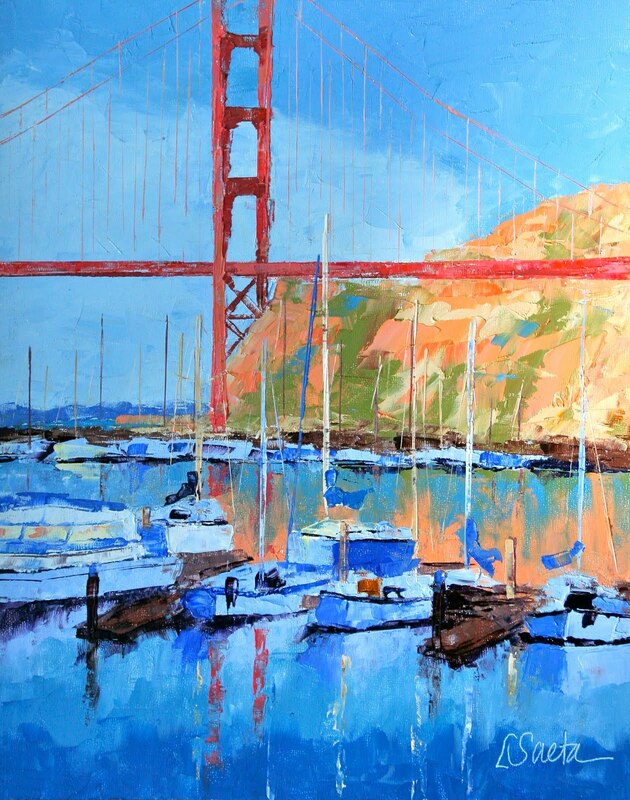 The Artwalk is held on Balboa Island from the hours of 9:00 am - 5:00 pm. I think it will be a really good show as there are lots of great artists in the show. My booth will be located between Topaz and Turquoise Streets, along the boardwalk. It should be tons of fun! This painting is a larger version of a daily painting I did a few months back. I love the colors and the bigger size really jumps out at you! Oil, 10" x 20" on stretched canvas. I am not sure how many of you have had a chance to catch my Blog Talk Radio Show. 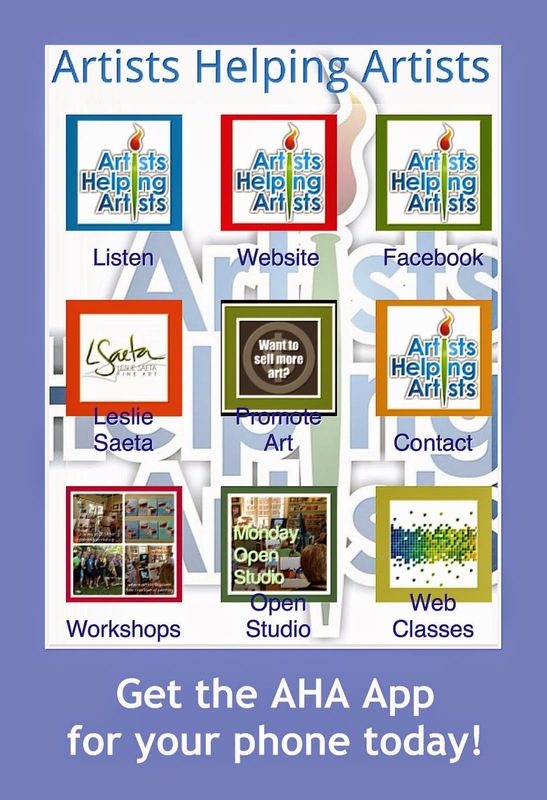 It's called "Artists Helping Artists" and we basically talk about ways to market your art on-line. It has been a wonderful experience for me and the good news is ... if you can't join the call you can always log on to Blog Talk Radio and listen to a recorded version of the call. Normally we have about 10 artists on the line but we average between 100 - 150 "listens" during the week. A dear friend (and amazing artist), Dreama Tolle Perry, has agreed to co-host the show with me. 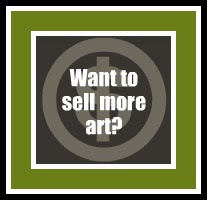 Today's call was all about Facebook, and how you can sell art using your Facebook profile, fan page and even advertising. 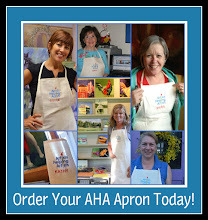 Next week we are going to discuss hosting your own art show, either in your home (or a friend's) or on-line. So stop by and join us. Or listen to past shows. It's fun! 6/3/2010 9:00 AM - Artists Helping Artists: Who's talking about you and your art on the internet. I am still getting ready for the Balboa Artwalk this Sunday. Still need more paintings so maybe I can have another "four painting" day tomorrow? Not likely! A few weeks ago I posted on my blog about how frustrated I was that I was having a bad painting day. After the day I had yesterday, I can honestly say that is behind me! Yesterday was just one of those days that I was in the zone ... and as a result I painted four paintings. Yes four paintings! And the best part, I like them all! The painting posted above is the fourth one I painted. I started it at about 10:00 p.m. but I was on such a role that I didn't want to stop. Maybe I was afraid that if I stopped I might lose the good painting karma? 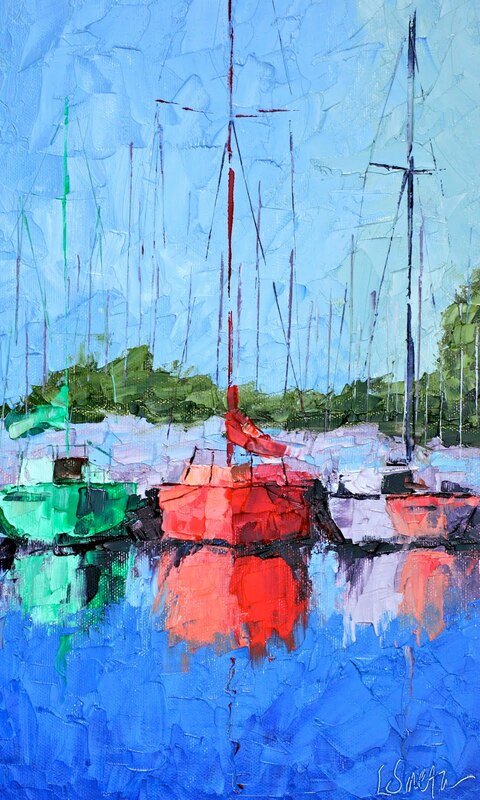 All four pantings contain my favorite subject matter (boats!) 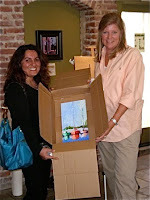 as I am getting ready for the Balboa Artwalk which is this Sunday, May 16th. I hope to see you there! I trust you all had a wonderful Mother's Day. Mine was pretty quiet but sometimes that's for the best. I wish I could have seen my oldest son today but he has another month before Stanford is done for the year. It will be wonderful to have him home. This week I will be painting a lot of boats and beach scenes as I finish up my work for the Balboa Artwalk. The event is this coming Sunday and although this is my first year, I am very excited to participate in the show. 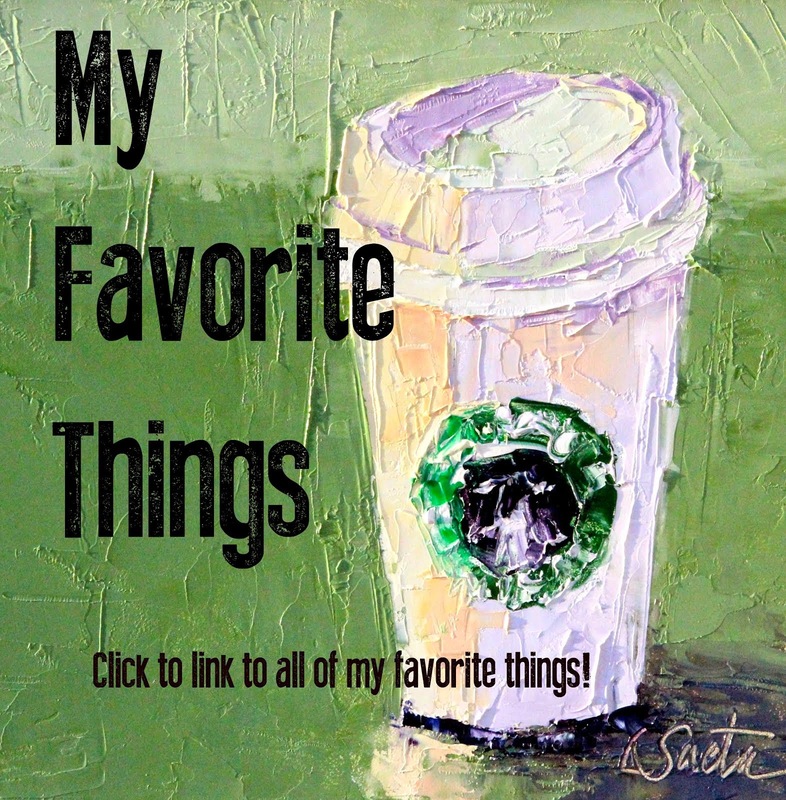 You might have noticed I have added Facebook "Like Buttons" to my blog. Feel free to click on them if you like what you see! 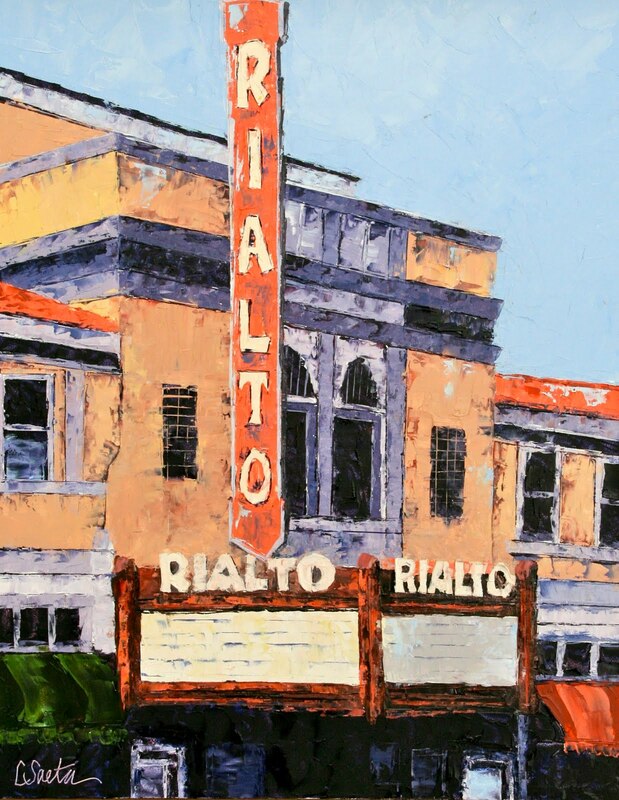 "Tickets on Sale at Rialto Theatre"
I do have the best job in the world. Being a mother (or "mom" as my boys call me) is the best. I can't imagine any other reason why I was put on this earth, other than to be a great wife and wonderful mother. Don't get me wrong, I love being an artist, but the best job in the world, hands down, is being a mom to my boys. Love you guys! Oil, 4" x 10" on canvas panel. Wow. It is so nice to be back in town. I did take the red eye last night so I am painting and typing on zero hours of sleep. I have never figured out how to sleep on planes. But you know me, I honestly believe that sleep is totally overrated and can always be made up tomorrow! After I unpacked my suitcase this morning I went up to my studio and painted this odd-shaped gem. I will have the perfect frame made for it! This painting is part of my "Headlines" show. I am in Kona right now and have had an amazing time. I spent a few days painting and enjoying the beautiful scenery. My highlight of the trip was spending the afternoon with Darrell Hill. We met on facebook and I am a huge fan. He was kind enough to meet me at my hotel and he painted on the beach. I was in awe of every brushstroke. I met his lovely wife and enjoyed watching one of my favorite artists at work. His art is amazing!